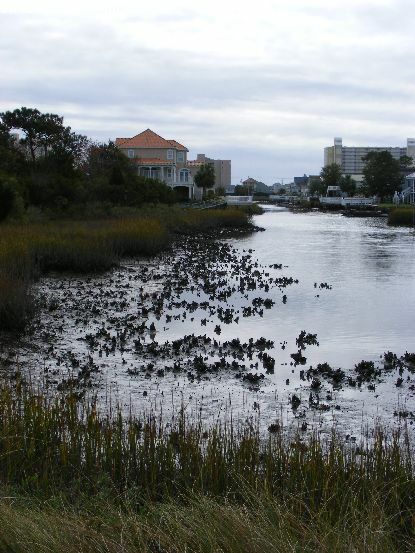 Ever wonder what is like to be in the middle of a saltwater marsh? 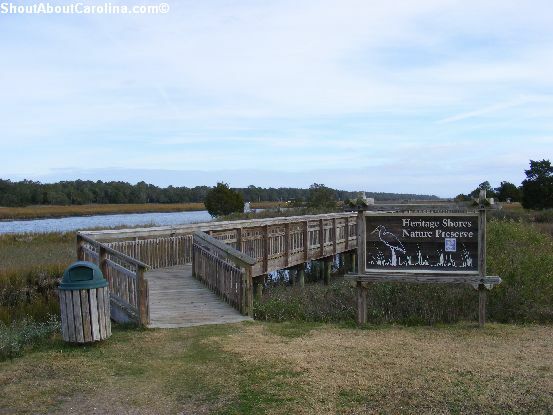 Visiting the Heritage Shores Nature Preserve is the perfect way to find out. 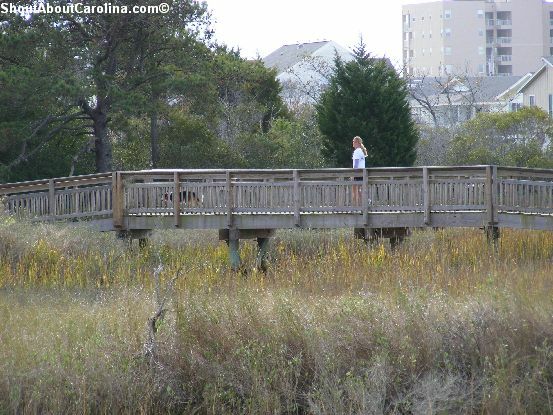 The preserve is feet away from Cherry Grove Beach and provides a mile long roundtrip boardwalk through a beautiful and diverse ecosystem. Admission is free and the park is open all day year around. 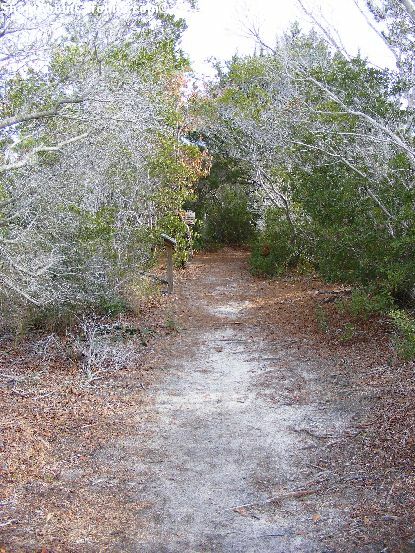 How to get there and where to park: The Nature Preserve is located next to the Cherry Grove Park and Boat Ramp at the end of 53rd Avenue North. 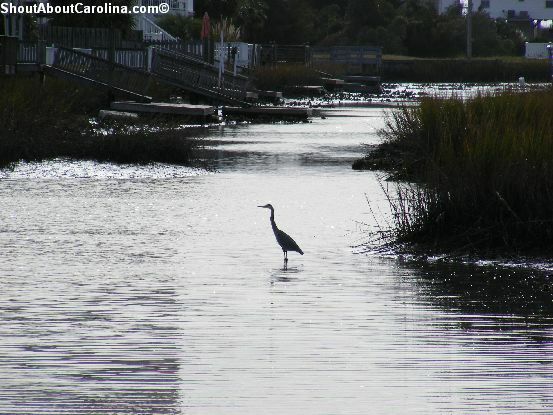 The park is a very popular fishing destination in North Myrtle Beach and most of its parking spots are designated to cars with boat trailers. The preserve has its own mini parking lot and from here talk the short walk to the preserve entrance (turn right, away from the boat ramp area). There are many interpretive signs about the marsh, fauna and flora you can observe along the trail. There is a boating dock and two shaded picning shelters (no restrooms). Bicycles are not allowed inside the preserve. Oyster reefs are nature’s purest water filters, capable of cleansing 10 to 15 gallons of water a day. Bird watchers enthusiasts are in for a treat. You can often spot blue herons, brown pelicans, white ibis and great egrets. 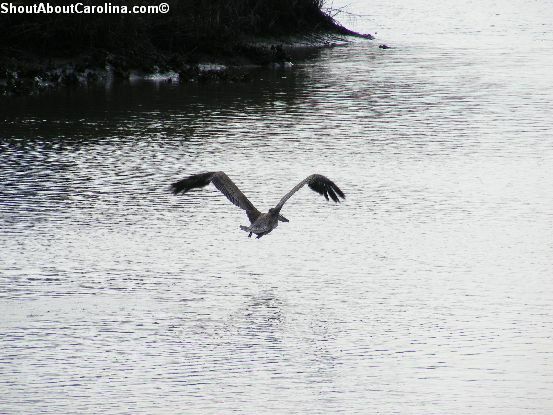 Occasionally you may see double crested cormorans, osprey, hawks and barred owls. A majestic looking brown pelican hunting for its next meal. When fishing pelicans dive bill first from up to 60 feet high. An air sack under the bill cushions the blow that will otherwise kill most birds. A pelican can live almost 30 years. 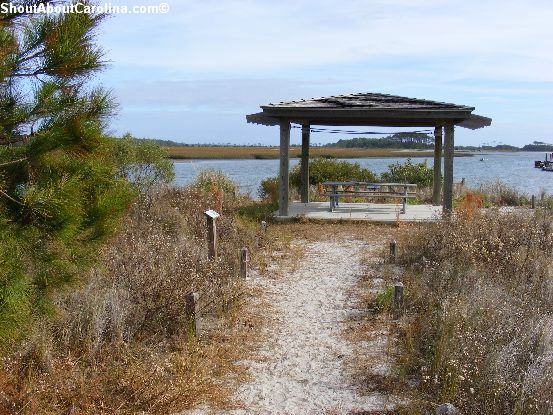 Scenic picnic area overlooking the inlet and the ocean. Dogs on leash are welcome inside the preserve. 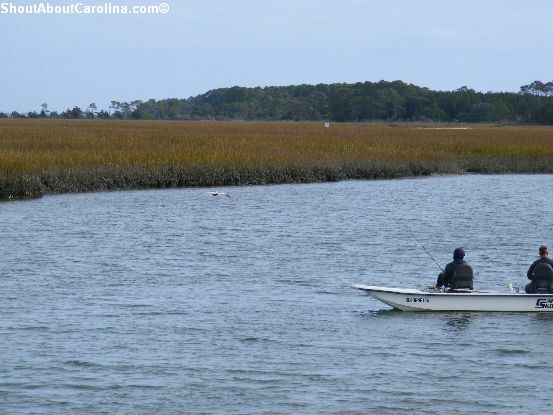 The Cherry Grove Hog Inlet provides good fishing opportunities for silverside, winter flounder, mummichog, pinfish, Atlantic croaker and striped mullet. There are many different trees inside the maritime forest preserve. 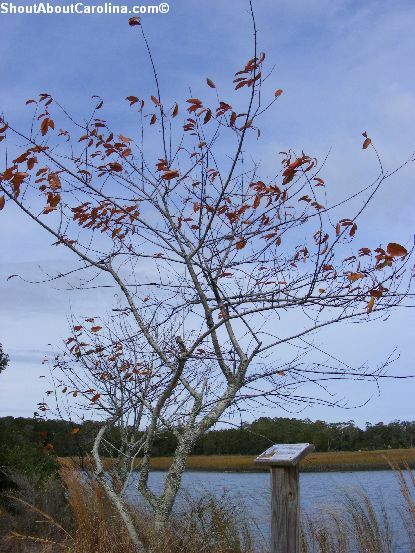 Here is an example of the sour cherry tree, where the Cherry Grove Beach name comes from. Other trees are the loblolly, red cedar (which is actually a juniper! ), wax myrtle, groundsel and the strange looking hackberry. 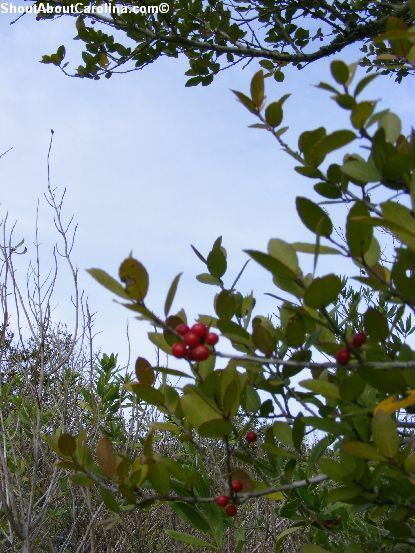 My favorite was the Yaupon Holly, a very important tree for the Native American tribes that inhabited the area thousands of years ago. 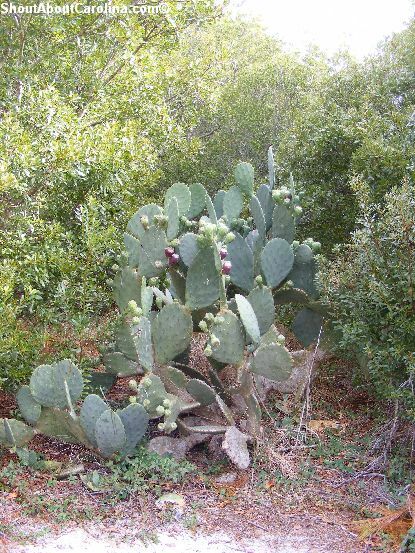 They used the caffeine-rich leaves for medicinal (“black drink” tea) and ceremonial purposes. Nowadays the berries are an important food source for many birds and small mammals. Animals big and small used to thrive in the maritime forest and the saltwater marsh, an excellent nursery home for many marine species. Who may live here? In the forest are red foxes, raccoons, white tail deer, broadhead skink; in the marsh crabs, snails, mussels, oysters, mud hoppers etc. While kayaking my husband was “escorted” by a noisy pod of bottlenosed dolphins who often come to the inlet to hunt for fish. Kayaking the Cherry Grove inlet all the way to the Atlantic Ocean (look out for friendly dolphins). Make sure to check the tide schedule and plan accordingly. Here is a more detailed list of affordable family friendly activities you can do from Wilmington NC to Georgetown SC. Have fun in South Carolina!